As a free RPG author, convincing a GM to run your game is not easy. You need to demonstrate in the blink of a discerning eye that your game has had enough thought and effort put into it to make it worth playing. If you would be delighted for other people to play your game then first impressions count above all. Your game might be a glittering gem - ideal for very person viewing your site but your 1990 HTML homebrew might well put them off before they've ever clicked download. Getting a free website has never been easier. The easiest and cheapest way is to have a blog and link to the game files. The benefits of blogs is that they have intuitive editors for writing about your game, a massive selection of free graphics templates and built in widgets to connect to your fanbase. The biggest two blogging systems are Google's Blogger (which the Free RPG Blog uses) and Wordpress (which I've used elswhere). A blog won't always let you put your game files in the same place as your blog. For game files, I recommend having a Google Docs account. You can upload big PDFs, Word documents or any other supporting file too. I also like that you manage versions there. The link doesn't need to change but the document you download can. Having blog subliminally suggests to your visitors that there will be regular updates but do not let that stop you. On the other hand, you can use the blog to put out thoughts about your game, ask questions of the community and write fiction too. Each post can be short - only a couple of paragraphs or an image. That might be annoying on a normal web page but people's expectations of blogs are much mo rerelaxed. If you find that lots of people want to chat about your game and comment threads aren't really enough then point them to the 1KM1KT Forum. If you end up with a lot of interest, we'll make you your own forum! Some commont things that might help you. Have the download front and centre. If the game has a nice cover, use that picture as a link to the download. Avoid large scripts of text - try describing your game in 20 words. Link to other places you like. Avoid putting lots of white text on a dark background, it's hard to read. Welcome them and thank them for their feedback. Avoid ads if you can. Introduce yourself somewhere. It's nice to know the game was written by a human. If you have this section in your game, rip it out and put it on your site. If you have a forum, expect to do most of the posting yourself. You will have to power the community, others won't do it for you. If it falls silent, it's better to not have one at all. 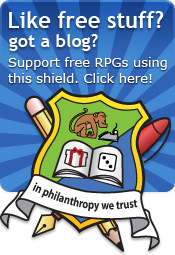 It's a wonder that with all that feverish creating, philanthropists have any time to create websites at all! However, they do. And there are some delightful examples. I asked the monkeys over on 1KM1KT what they thought and my good friend and fellow philanthropist Jason 'Chainsaw Aardvark' Kline came up with some super examples. So, here are some lovely sites, in no discernible order whatsoever. A professional looking home that ticks all the boxes. 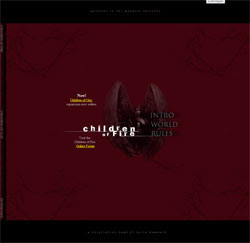 The game is right there ready to download, there is a simple menu and it has an evocative logo. It might be too plain for some but I like its simplicity. It also have the joyous features of social integration and forums. A simple home for a lite game. 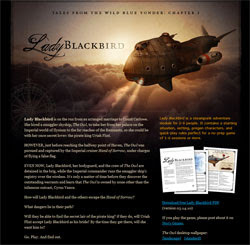 Lady Blackbird relies heavily on a single beautiful graphic and is a single page but it does its job very well. I particularly like the little rules pages on the right hand side, a sneak peek into what you will be getting. An evocative blood red page that draws you in to click once more. I'd like to have the downloads a little more prominent on the front page but at the same time I rather like it as it is. Another clean and professional looking site. The typography is particularly easy to read. Not sure everyone will like the Scribd plug-in on the front page since Scribd went evil on us. The Mysterous Anonymous Benefactor (MAB) has done a splendid job on it. A bold site with some cool graphics that show you what you're getting. You're getting lite, fun and dungeon hacky. And that's what you're getting. I would probably have a link to the core rules right there on the front page. The news isn't updated enough to pretend it's a rocking high-speed blog. Small and neat, you can get at the game right there. The cover is close at hand too. The images are click-able and there are links to the community too. It gets my vote. 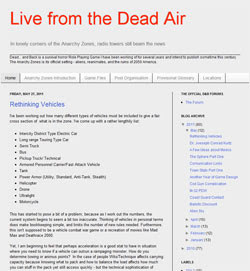 The Live From The Dead Air blog is the homepage of the Dead and Back RPG (Jason again). 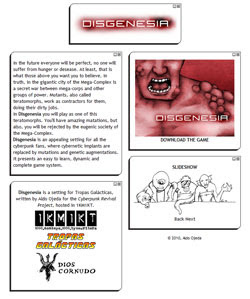 It's a good example of using Blogger to have a blog section (where he publishes short stories from the game world) and the game on a separate page. It's not particularly pretty but it does feel like the grey grit of the game itself. I've probably missed some corkers? Is there a free RPG game homepage that is so staggeringly breathtaking that I should really have mentioned? Is there a homepage where you downloaded the PDF before reading the text and realising you've just downloaded "The Hot Goats' Love Nest RPG"? * Please do tell the world in the comments below! * If you have, please keep it to yourself. P.S. I currently hate the Icar homepage, so let's just ignore that one, OK? 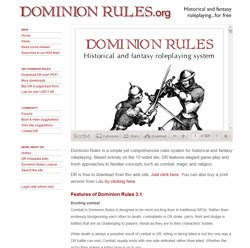 Note to self: add link to PDF of my game to front page of site. I'd definitely agree on getting rid of a forum if it's not being used. A dead empty forum is worse then not having one. Thanks for adding Disgenesia to the list. I must add a contact and feedback button. Those are some good tips with some things I hadn't really thought of myself. I have to learn to be less verbose about describing my games (and to promise less!). Good post! Chaps, thanks for the feedback. I think a website is both easy to do and easy to get quite wrong. What's more there, are some simple things we can all do that can help a user a lot! Thank you for the shout-outs. I'm glad i could help. I'll try to incorporate some more of the best practices mentioned. Any specific suggestions for my blog to make it a better example to others? On the matter of hosting the game's PDFs, I should mention box.net. Visitors can both preview files, and download them without the wait Megaupload forces. Kirin from oldschoolhack.net here, thanks for the kudos on the site design. If anyone has any specific questions, I'd be happy to answer 'em. Main web page uses Wordpress, a very solid and design-friendly CMS, with a handful of cool plugins. It also has a nice traffic-monitoring plug-in for seeing how much your stuff is being downloaded, as well as showing who's linking to you. Forums use Vanilla 2, which is a super nice package for "smaller size" forums. Social networking stuff is tricky, not so much plugging it into your site (that's easy), but knowing how much to use. Great tips. Very useful to know and those are some pretty sweet games you point out. I really like Old School Hack, but Lady Blackbird looks pretty cool. CA - I would have a link straight to the download of the PDF in the top right. I'd simplify the description text to something like: "Dead and Back is a post apocalyptic-horror RPG set in 2050 America. You can download the rules, the default setting or read supporting fiction...". Don't menion your intended publish date! I'd also add a header graphic if you can. Kirin - thanks for the technicals, I think pointing out how easy it is the first step for any reader to make best use of the advice! Nice! I've always thought that Old School Hack was one of the best-designed sites I've seen. The game is equally well-designed, visually. I think the guy is a professional designer, but don't quote me on that. It's worth letting people know that they can have a free blog with their own domain name for a fairly minimal cost (about $20, from memory). You get you blog sorted out, purchase your domain and pay a small cost for linking the two (this is my experience with Wordpress, anyway). Also, Dropbox let's let's you share files with the public, if you want. Carpe - OSH review is about to be let out! I still have mixed feelings about its layout. Nathan - thank you for the pro-tips as always - very helpful!